When many people come together for a common purpose, remarkable things occur. This is truly exemplified by the organization that is HOSA. Because of HOSA’s dedicated leaders and the enthusiasm of the membership, the HOSA experience remains fulfilling and enjoyable. During HOSA events, the passion for healthcare is tangible and the love for our organization unites each of us. As a part of the HOSA family, together we will continue to develop leaders to ensure a future of quality health care providers. HOSA provides the opportunity for members to explore their interests by becoming actively engaged in the health science industry. When I began high school, I was confused and lacked clarity about what my future entailed. However, when I became involved in HOSA, it served as a beacon allowing me to immerse myself in medicine. This is when I discovered my passion for neuroscience. My HOSA journey exemplifies the positive impact which this organization has on its members. I wish to see numerous others experience what HOSA has to offer. As we continue our journey towards defining our purpose, be sure to carry with you the values that define HOSA, because you, too, may serve as the beacon for another to follow in their own journey. 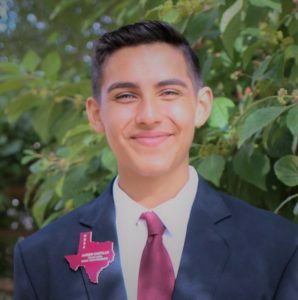 I look forward to making lasting memories with the members of Texas HOSA at the State Leadership Conference in San Antonio! Continue working hard, best of luck, and see you soon. 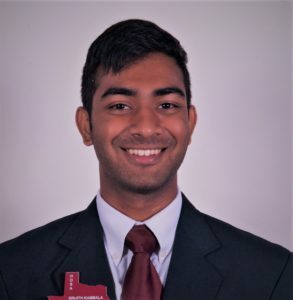 Srijith Kambala, ,senior at Michael E. DeBakey High School for Health Professions in Houston, Texas, and Texas HOSA State President. As I begin my fourth year in HOSA, I look forward to the opportunity to share my love for HOSA with all members across Texas. Throughout my high school life, HOSA: Future Health Professions has helped me create lasting memories and friendships, and powerful experiences in the healthcare field. My goal is to inspire others to become involved in HOSA and define their purpose in the healthcare industry. I aspires to utilize what what I have learned through HOSA to pursue my dream of becoming a successful neurosurgeon. HOSA has guided me in this goal through participation in an epilepsy research program at the Texas Medical Center. I intend to continue taking meaningful steps towards my goal of neurosurgery in the future. No matter where my journey takes me, I will continue to be involved in HOSA and will never forget the impact it has made on my life. During my free time, I enjoy being with friends and playing sports. I believe that lasting friendships are the most important things to develop. I am extremely appreciative of the opportunity that HOSA gives its members to network and meet with others from all walks of life. I encourage members to get out of their comfort zone and interact with as many other people as possible to gain different perspectives and form friendships. I take to heart the idea of overcoming fears and seeking opportunities. As Will Smith said, “God puts the most beautiful things in life on the other side of fear.” HOSA has allowed me to overcome my fear of public speaking. I know HOSA can inspire confidence and success in the lives of all of its members. I look forward to serving Texas HOSA, and I am excited for its future! Aaron Castillo, I am a senior at the Harlingen School of Health Professions in Harlingen, Texas. Throughout my journey in HOSA, I have strived to give back to the organization that has made such a large impact on my life. From serving my chapter for the past four years to representing Area 7 as an area officer, I have truly learned that HOSA is more than just a organization but a family of like minded individuals who love and care for each other.It is through these ideals of family that I aim to show Texas HOSA members that being in HOSA is about more than just competing, it is about the experiences you have and the friendships you make. 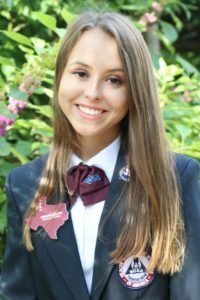 As a state officer, I hope to continue to promote the idea of our, “HOSA family,” and encourage all members to meet other members from across the state of Texas and the world to create friendships that can last a lifetime.I look to continue spreading my passion for healthcare by becoming a fetal surgeon with the ultimate goal to help women in impoverished countries have healthy babies and provide them with better quality of life. It is through my career that I hope to one day find a cure for spina bifida and other congenital abnormalities to improve the lives of infants all over the world. I also like to frequently trade in my white coat for an apron, as I have a deep passion for baking. Whether it be a cheesecake or a snickerdoodle, I live by the quote, “If there’s a whisk, there’s a way.” No matter how busy life gets or how stressed with school I may be, if I pick up a whisk and start baking I can get through anything. But before you go, I want you to always remember one thing: Even if you fall, whether it be on accident or on purpose, you must pick yourself back up and keep going because the world keeps turning and you shouldn’t miss a second of it, because your journey awaits. Arianna Selph, I am a senior at George Ranch High School located in Richmond, Texas. Over the years, HOSA has allowed me to reach my full potential and strive for my dreams, something I wish to share with all members across the state of Texas. I began my journey freshman year by becoming a HOSA member, later going on to becoming a chapter president, Area 2 Secretary, and now completing my journey as State Secretary. I strive to show that through hard work and dedication, all is achievable in life. “If you tell people where to go, but not how to get there, you’ll be amazed by the results.” This quote by George S. Patton is one I take to heart and choose to let guide my life. This embodies the direction that I hope to guide HOSA towards: members choosing their path in life, and creating a journey out of wherever it might take them. As a state officer, I hope to spread encouragement and inclusion of everyone embarking on their HOSA journeys. My passion for serving others and love of medicine led me to strive for a profession in the medical field through the help of HOSA. Later specifying that I love children and am interested in the human heart, I aspire to become a pediatric cardiovascular surgeon. I aim to open clinics around the world to educate on self-care and teach medical techniques that communities would otherwise not have access to. While I am fiercely dedicated to HOSA, I also love crafts. If you need a scrapbook, thank you gift, or have a crazy idea off of Pintrest, I’m your girl! I aim to incorporate this as much as I can into my HOSA career and use it as a tool to put a smile on other’s faces and keep them fiercely motivated to aim high and achieve their wildest dreams, all the while enjoying the amazing journey that awaits them. Angelica Montes, I am a senior at South Texas Academy for Medical Professions, proud to represent Area 7 from San Benito, Texas. My HOSA journey started freshman year, where I’ve served as chapter President the past three years. I am also a fierce competitor in CPR/First Aid, placing first at Area, State, and Internationals. I owe much of my success not only to my partner, but my HOSA family for the shared support and encouragement I will always cherish. It is the spirit and passion of all HOSA members that drives me to want to serve others and spread the “HOSA hype”! 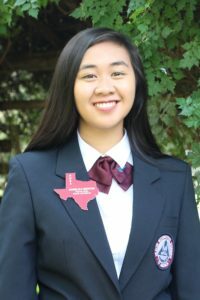 Serving as a state officer, I wish to encompass my own HOSA hype in promoting unity and excitement through the members of Texas HOSA, as they embark upon their journey in defining their purpose. As historian, I most look forward to capturing memories and doing my best to showcase Texas HOSA. 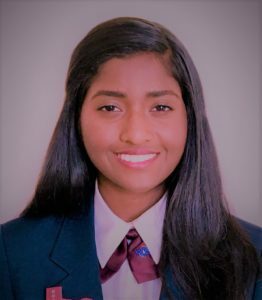 It was my initial passion and interest in medicine that first drew me to HOSA; my favorite quote being: “Medicine: The only profession that labors incessantly to destroy the reason for its own existence”. This year, I am working toward becoming a nationally certified Emergency Medical Technician in efforts of fulfilling my ultimate goal of becoming an ER physician. I live for my love for medicine that is always accompanied by my love for humanity. My love for HOSA gives me a warm fuzzy feeling inside- one that can also be ignited whenever I play my ukulele, practice jiu-jitsu or krav maga, celebrate Christmas, share punny remarks, and express my Texan pride. I am ready to carry this warm fuzzy feeling with me throughout the journey that awaits this upcoming HOSA year. 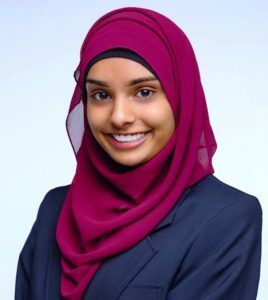 Hebah Tanveer, “If the whole world was blind, how many people would you impress?” - Boonaa Mohammed I live by this quote. As a senior at Frisco Centennial High School, I believe that character is about what’s on the inside. Character is about what everybody doesn’t see, and character development often entails a long and complex journey. My journey began in ninth grade, when I attended the Texas HOSA State Leadership Conference in Galveston. Here, I witnessed the poise and dedication of the state officers and marveled at how anyone could be that polished. Now, as a state officer myself, I understand that a lot of hard work is required to maintain that sophisticated image of a leader. Having served as chapter officer for HOSA, FCCLA, and NHS, I am no stranger to the term “leader.” However, through my state officer experiences, I realize that leadership is a flexible term that means a lot more than delegating tasks. Leadership is about helping others reach their full potential. This is an ideal I want to incorporate during my time as a state officer. I hope to help Texas HOSA members navigate their own respective journeys towards the field of healthcare. In the future, I aspire to be a molecular biologist or bioengineer, innovating solutions to better people’s lives. But until the future comes, I enjoy painting, shopping, speaking, and Netflix-ing. As an avid collector of scarves and memories, I am excited for the 2018-2019 Texas HOSA year and cannot wait to meet everyone at the State Leadership Conference in San Antonio!